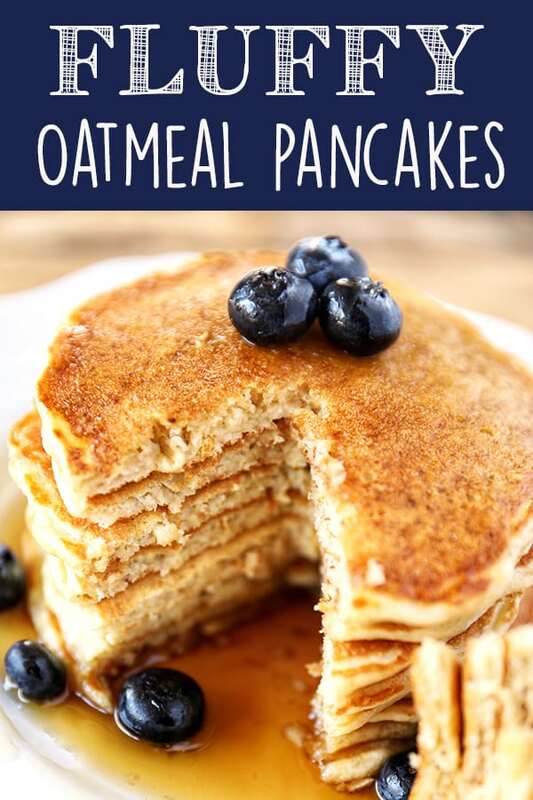 These multigrain Oatmeal Pancakes are fluffy and hearty and sure to become a family favorite! Made with buttermilk, old-fashioned oats, white whole-wheat flour and sweetened with just a touch of pure maple syrup. 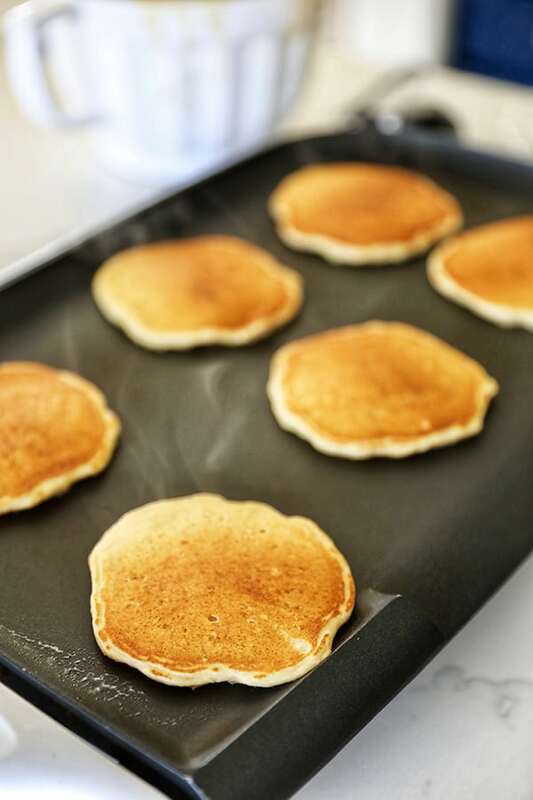 These oatmeal pancakes have become our go to weekend pancake recipe. I love that they are multigrain and sweetened with just a touch of pure maple syrup. My kids love that they are so fluffy and tasty! Start by soaking old-fashioned oats in the buttermilk for 10 minutes. This softens the oats and makes for an outstanding texture! 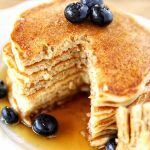 This oatmeal pancake recipe is healthy, but so tasty! 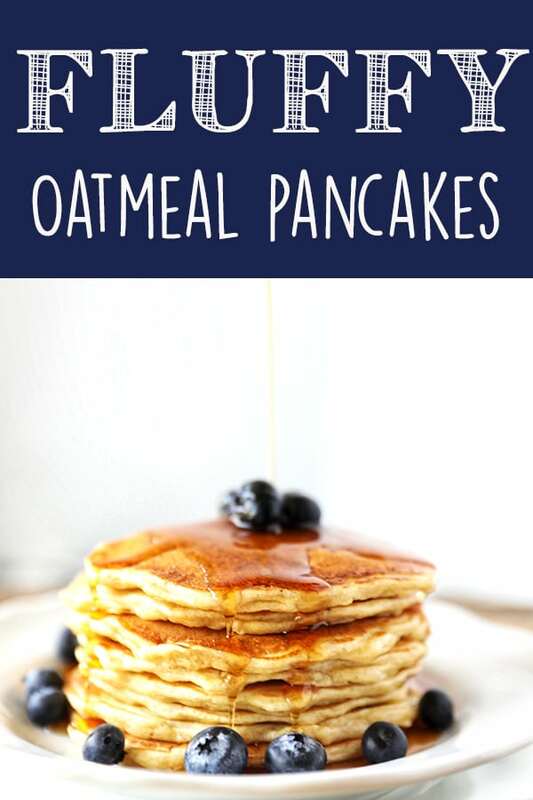 Old-fashioned oats, white whole-wheat flour for texture, tangy buttermilk instead of butter or oil and lightly sweetened with pure maple syrup instead of granulated sugar. Our family has made these oatmeal pancakes dozens of times now! They are perfect paired with blueberries or raspberries. 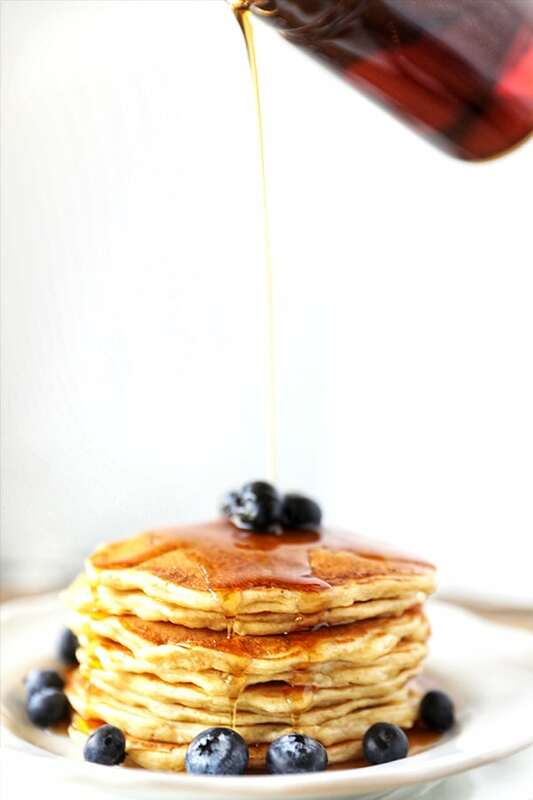 Since this oatmeal pancake recipe is not heavy on added fat or sugar, you can add a smear of real butter and a drizzle of maple syrup for a truly delicious pancake breakfast. 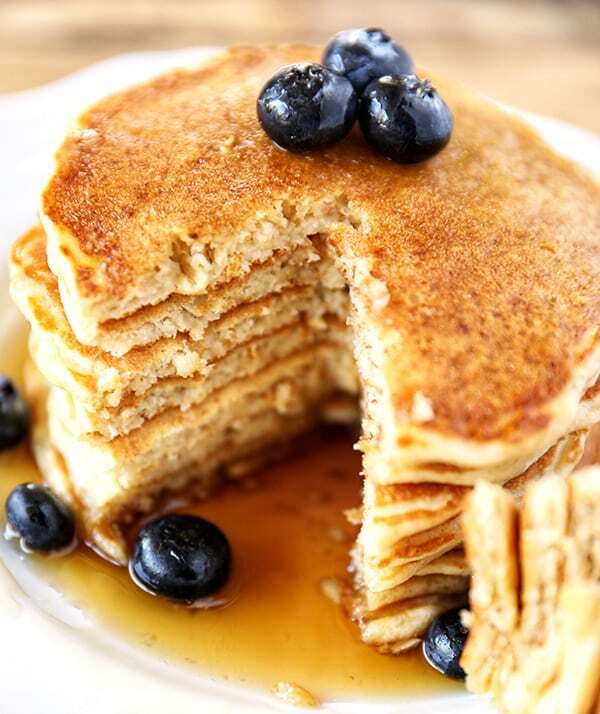 Hearty oat pancakes are great served with almond butter or peanut butter too! 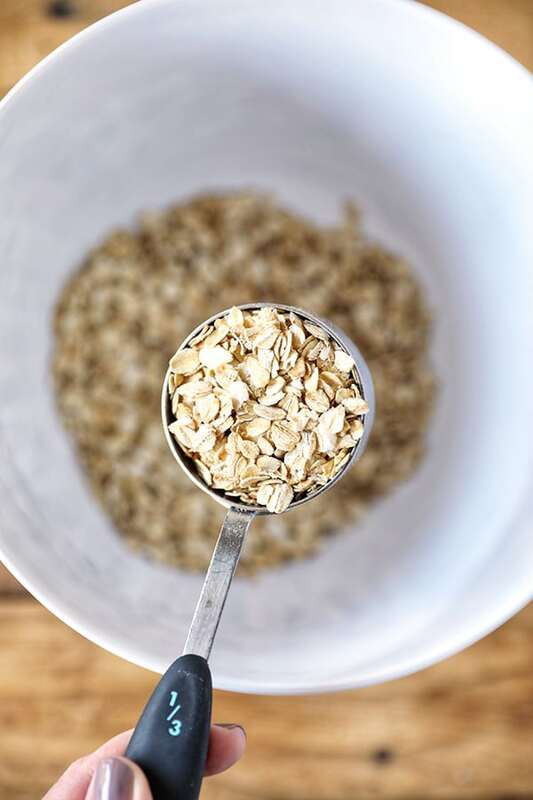 In a large mixing bowl, combine dry oatmeal and buttermilk and let soak for 10 minutes. In a small bowl, combine flour, baking powder, baking soda and salt, whisk to combine dry ingredients. Heat a non stick electric griddle to medium heat. 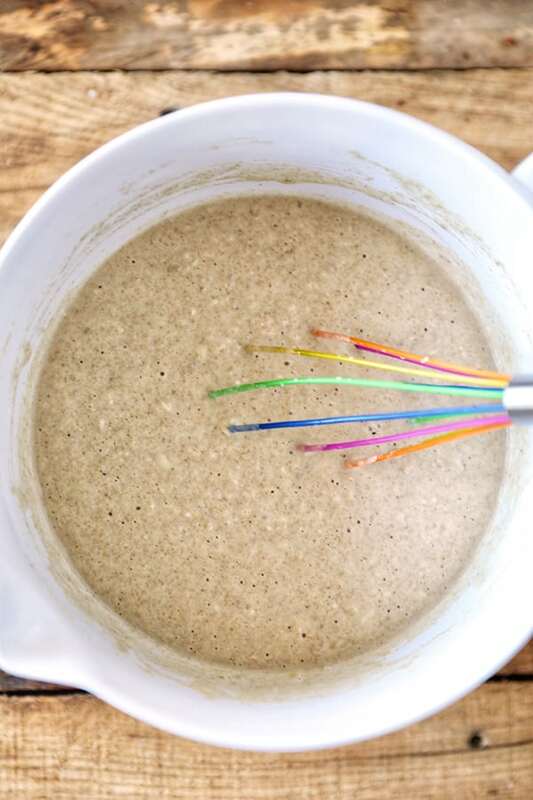 Add maple syrup, vanilla and egg into buttermilk oatmeal mixture and whisk together. Add dry ingredients and whisk just until combined. Measure 1/4 cup batter onto hot griddle and cook until edges are dry and starting to set. Flip and cook other side another 2-3 minutes. Serve with butter and warm pure maple syrup. Make sure to use white whole-wheat flour in this recipe for the best texture. Spray griddle with non stick cooking spray prior to cooking pancakes, if needed. FYI Eggs arent listed in ingredients, but is mentioned in the directions! Thank you so much for the comment, Kim! I updated the recipe card. Just made these—breakfast for dinner with eggs and bacon. Delicious!! Thanks! Just made them. I added some orange rind and orange extract and sprinkled with blueberries. The were delicious!! Thank you, Terry! I just love this recipe, I’m so glad you enjoyed them. Your additions sound so delicious!